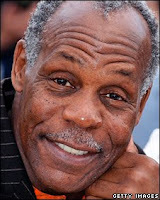 Actor Danny Glover, right, has decided to take up the cause of global warming. We were unaware that he was interested in this issue. However, Mr. Glover appears to be a little misinformed about what global warming does and does not cause. He caused quite an uproar by saying the earthquake in Haiti resulted from global warming and the failure of the climate summit in Copenhagen. If you want to get serious about this issue Danny, give us a call. Zoe Saldana: "Star Trek" and "Avatar"
Glenn Beck Does Not Like Term "African-American"